I can never complain that my life is monochromatic. In the month of July we’ve actively grandparented for 2 weeks, travelled interstate, and survived (just) a super virulent bout of flu. In my kitchen, recent activity has centred around simple food for the kids and comfort food for the ailing. Home made chicken soup with various ethnic influences has been a menu staple. I’ve made Vietnamese pho, Chinese style congee, Greek egg & lemon soup and what our family euphemistically calls Jewish penicillin, a simple chicken broth with vegetables and brown rice. Mondays and Tuesdays are the best days to visit my local supermarket to find organic free range chicken at a heavily reduced price. The rib cages and wings go into the stockpot, and the remainder is portioned and frozen for weeknight dinners. Also in my kitchen are bags of sweet Australian navel oranges. The juice of these beauties provides a healthy dose of vitamin C, essential in the cold and flu season. I like to start each day, no matter the season with the freshly squeezed juice of two plump oranges. It’s a wonderful wake up call. Oranges are cheap and versatile. We often hear of local citrus farmers dumping their crops because they cannot compete with the price of imported fruit. Buy Australian oranges!! In readiness for a Cookbook Guru post, I am making pickled oranges, they need a whole week in the spiced vinegar before being ready to eat. They’ll make a fresh accompaniment to roast pork. In my kitchen is a pile of Australian Gourmet Traveller magazines. Browsing through this high class publication satisfies my hunger for beautiful food and a warmer climates. 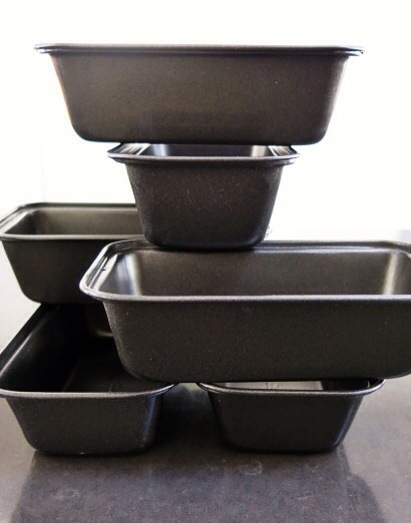 In my kitchen are six new individual sized loaf tins. After my success baking Carrot and Cornmeal Soda bread last week, I started thinking about making smaller loaves for more flexible baking and storage and serving options. I’ll need to adjust oven temperatures downward and watch the baking loaves closely, but fingers crossed they’ll be a success. I have an over abundance of egg whites in my kitchen. They prompted me to pull from the bookshelf Peter Russell-Clark’s Egg Cook Book, looking for inspiration beyond pavlova and meringue. He offers up a recipe for a Whisky Sour as an alternative for use egg whites. I like whisky neat, on the rocks, so won’t be heading down that path. It was fun to revisit this quirky publication and despite the lack of egg white inspiration I’ve bookmarked a couple of recipes to revisit. And speaking of eggs, a carton of free range eggs I picked up in my local supermarket last week has been a joyous surprise. Every single one, of the eggs have been double yolkers!! That’s eight double yolked eggs so far. Celia at Fig Jam and Lime Cordial hosts the monthly In My Kitchen forum for food bloggers from around the world. Make yourself a cuppa, click on the link and take yourself on an enjoyable world kitchen tour. I am posting the pickled orange recipe later today. They are really delicious, a nice fresh balance of sweet, acid and spice. I hope you try them.. I don’t think I’ve ever had a double yolker! I’ve also never had the egg and lemon soup either so am definitely going to try that one. Thank you for sharing and also thanks for bringing back memories of Peter G’Day, Russell, G’Day Clark! Hey Vicki, I’d totally forgotten about the G’days!! Thanks for the laugh..
Haven’t had egg and lemon soup in years, thanks for reminding me! I can’t believe all the double yolked eggs, I’ve only ever had one in my life, and I always buy free range eggs! Thank you for your post. Love this series and LOVED the peek at your August Kitchen! The pickled oranges are awesome. Those pickled oranges sound wonderful! Double yolks are a genetic thing. It’s a good sign that the hens that laid your eggs haven’t have their breading messed around with too much. I have laying hens and I have a few that consistently lay double yolkers. It’s always a lovely surprise. I’m going to give the pickled oranges a try. Thanks for the tour. 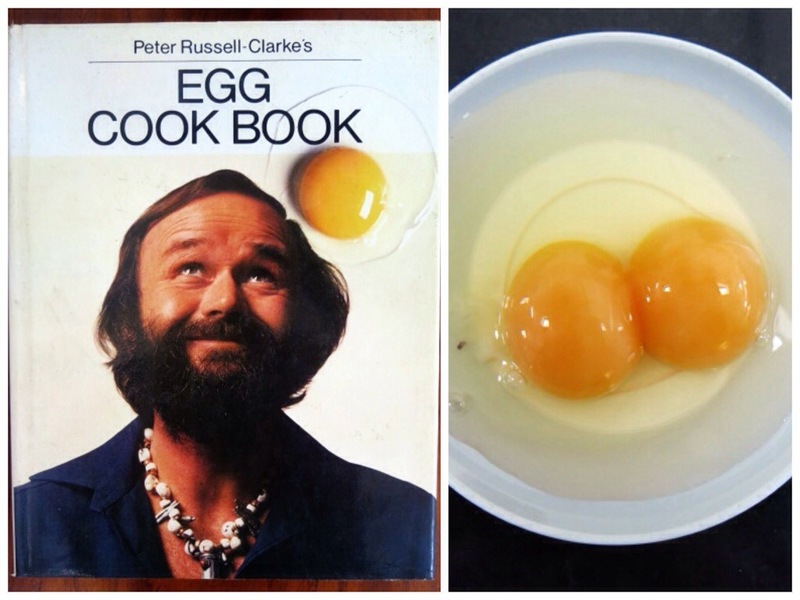 Just thought double yolkers were random, like human twins. It was such a buzz to have a whole carton of them. I’ll post the orange recipe next week. pickled oranges-looks great. and how lucky with those eggs. Thanks for visiting my kitchen Sherry. G’day! Love your pickled oranges and your lemon and egg soup! Love how versatile egg whites can be too and thanks also for this month’s kitchen view! Hi Joanne, Always nice to see you visit, I’ll forever chuckle to myself about Glad Wrap tabs when I see you…. All of those double yolkers – what a bonus! I can’t remember the last time I saw one. They must all be ‘quality controlled’ these days. Great tip on the chickens at the supermarket too. I freeze the carcasses after we’ve eaten until I have enough but that’s a helpful tip to boost the stock. I’m loving those little loaf tins hard as there’s only two of us and that’s a lot more practical. I’ve pinned them for future reference. Oh boy I was so excited by the double yolkers, can you believe it, a whole carton! Are you in Australia? Coles had the small loaf tin 2 for $3, a bargain! What an interesting combination of flavours! Luckily we have a family friend with orange trees so we don’t have to buy supermarket ones. Buying imported fruit and veg just feels wrong when you have such great local produce! Here here, we need to support our local producers! Hope you feel better. Amazing eggs indeed! Thanks John. Looking forward to using my small loaf tins. With just two of us, a full loaf is past it’s best by the time we get to the end. I’ll be posting the pickled orange recipe early next week, they hold great promise. i’ve heard about lemon pickle in middle east and greek cuisine but never know any of orange pickle…. btw, did it used as a side dor roast pork or it can also be stuffing or flavouring the roast pork??? Peter Russell Clark, had forgotten about him. Haven’t things changed dramatically? Loads of TV selections about cooking, competing and great international food shows. Wonderful bloggs about sharing food and ideas. Love it! Mmm, egg & lemon soup, that’s a trier and pickled oranges sound great. That egg book still has value, not much has dated like some others from that era, one of the original celeb chefs! So sorry to hear that your family has had the flu but it sounds like you prepared warming and comforting dishes to help you feel better. 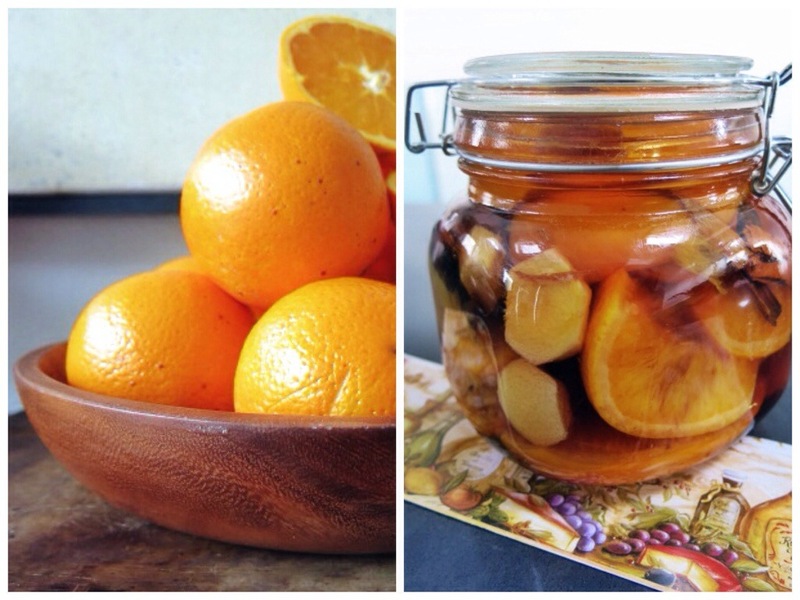 Your pickled oranges sound like they would be great…I’m looking forward to your recipe. I can’t believe I’ve never had egg and lemon soup, time to remedy this. Hope you are feeling better – lots of oranges and congee sounds like just the thing for winter. Thanks Celia, I have nuts in the fridge, I’ll make a batch today. They sound delicious! And thank you, mine are in the oven, they smell divine!! I’ve never heard of pickled oranges before but I do like the sound of them. I think I could spy ginger and star anise maybe in the jar? That cookbook front cover is a classic! So 70’s. I’m always happy to answer questions Fae….I have small airtight plastic containers in which I freeze egg whites. Three seems to be the number I always have, but i label them if it differs, though it’s worth knowing a large egg white generally weighs 40g. They are just as good as fresh egg white. You need to let them thaw thoroughly and then come to room temperature before you use them. Those oranges made me drool…. perfect, they are simply perfect! nice to see your kitchen! Nice to have you visit Sally…. It really dates the book, 1979! You can really tell that cookbook is old! What a great cover photo!!! Great post. Glad everyone survived. Very amusing – monochromatic avgolemoni soup to go with your opening line. You have photographed it brilliantly! Not easy photographing shades of white. Hope the Jewish penicillin worked – we called it that, too. And, I’m with you with the whisky – if single malt, then definitely neat or on ice. Love the pickled orange. Yeah, just about right now thanks! The Tasmanian Lark Single Malt certainly helped. 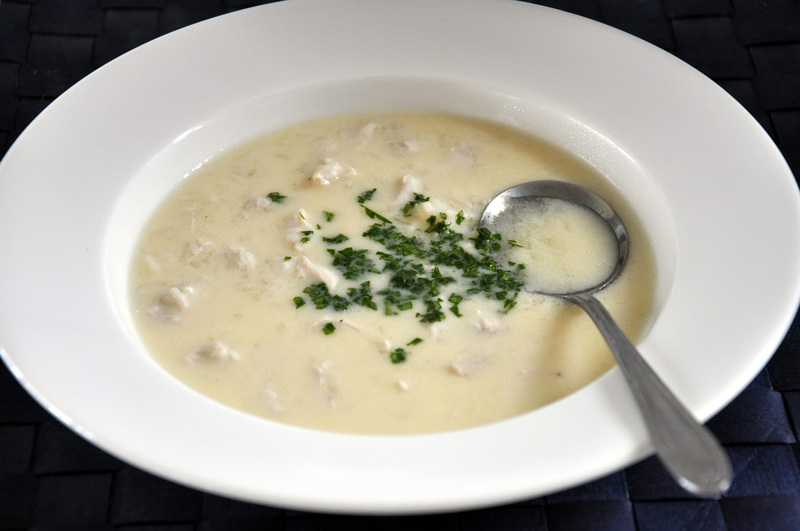 Really happy with that white soup photo and the soup itself! Have never made Greek egg and lemon soup – just looked up your recipe. Perfect weather for it here in Melbourne! And a big YES to Australian oranges – seeing Californian oranges in our supermarket makes my blood boil. Your pickled oranges sound and look amazing. PS. I’m positive a carton of double yolkers must mean good luck. I was so excited when I cracked open the first double yolker, but when they kept coming It was almost miraculous! Try the egg and lemon soup, it’s really beautiful! Peter Russell Clarke- now that is so retro. I am with you on the local oranges. Recently I noticed a supermarket, I think it was Coles, with a huge display of Californian oranges. Why oh why is this so? Two answers spring to mind. They were cheaper than the local ones and so were passed on to our unsuspecting shoppers. Or, the local ones were unavailable as all the Mildura farmers were forced to rip out their groves some years ago because supermarket monopolies wouldn’t pay a fair price. I walked out in disgust. It is OK to feel indignant- and the sooner we express this, the better. Your soups sound very restorative- glad you survived the onslaught. 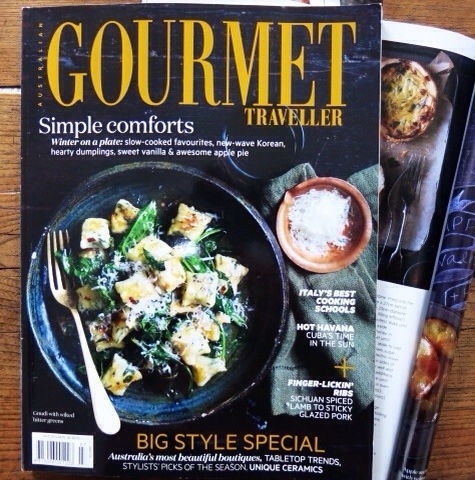 Browsing the Gourmet Traveller mags should help to. Retro is a great way to describe PR-C, it’s such a quirky book! I won’t buy oranges or any other fruit and veg for that matter that is imported. It’s just totally unnecessary when we grow such beautiful produce here, and really, how much do you save, a few measly dollars! Why would anyone want to buy non Australian oranges if they all look like that. Pickled oranges sound interesting. I agree Ann, Aussie oranges are beautiful AND cheap, but the supermarkets screw the growers on price so harshly that in the end the orchardists claim it’s cheaper to rip out their trees. I like my whiskey neat, too. I buy Australian oranges where I can and I shop locally. We can’t give it all to the supermarkets. I will forego oranges if all that is available is imported. Luckily I can always buy Aussie fruit from a grower at my local Farmer’s Mkt, 10kg for $14, big, sweet and super juicy. I buy very little in the supermarket, use it for emergencies mainly. Can’t complain about the double yolked eggs though, big bonus! This entry was posted on August 1, 2014 by ladyredspecs in Food.